To tell you the truth, I'm NOT crazy about pumpkin. In fact, I don't really like it at all, especially in desserts. (That loathsome, jiggly, sickly-sweet disk of pumpkin pie, sweating on the Thanksgiving table, really takes the cake, so to speak!) But my husband, on the other hand, is a pumpkin fanatic through and through! Add pumpkin to anything and he's a happy man. So, when he had a rough day last week I thought I'd make him something a little out of the ordinary to cheer him up. It was a rich pumpkin spice cake. I decided to slather on a salted caramel glaze that was to die for, just because. Nothing but the best! It turns out that I'm just a little crazy about this cake! 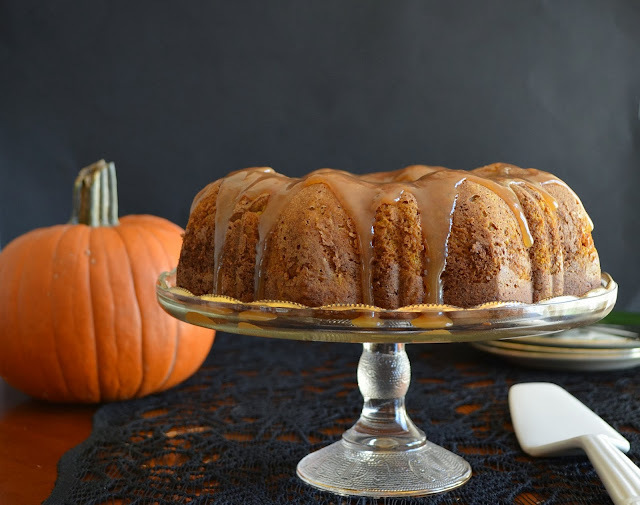 It's moist and tender with silky ribbons of pumpkin woven through the batter. But, that's not all! As if it wasn't delectable enough, the thick, velvety, salty homemade caramel sauce that's drizzled on top will fly you to the moon! Really, who wouldn't like something that's drenched in rich, salted caramel? Now, I know I'm going loco, because I even had this cake for breakfast the next morning! Still moist, still heavenly, still utterly mouth-wateringly delicious. 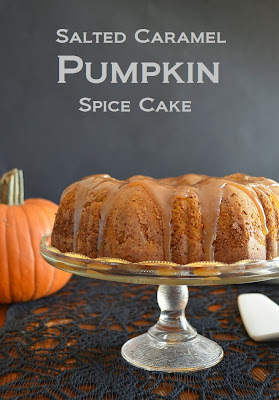 Perhaps I'm turning into a pumpkin dessert fan after all. Just don't expect a pumpkin pie around here any time soon. Preheat your oven to 350 F (180 C). Butter and flour a Bundt pan very well. In a large bowl, beat the butter and brown sugar together until soft and fluffy. Beat in the vanilla and the eggs, one at a time. In a medium bowl, sift together the flour, baking soda, baking powder, cinnamon, ginger and salt. Add the dry ingredients to the butter mixture and beat just until evenly moist. Add the pumpkin and fold until nearly combined. 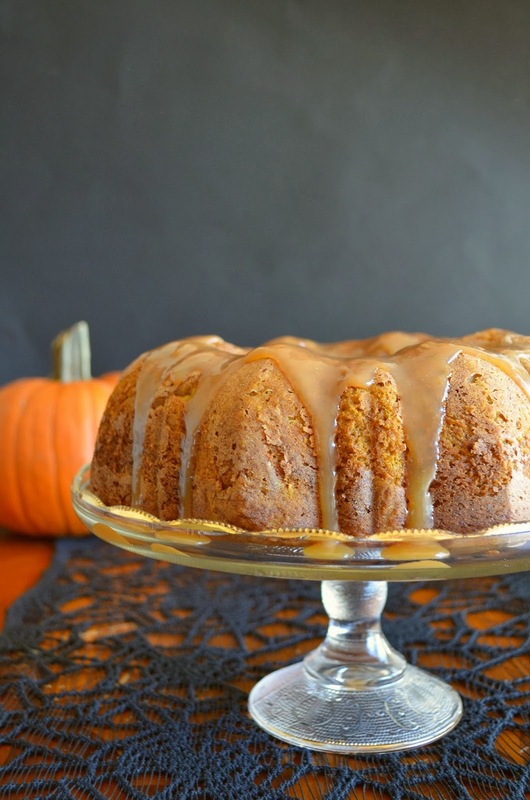 There should be a few ribbons of pumpkin streaking the batter. Pour the batter into the prepared pan and smooth the top. Bake for 40 - 45 minutes until a skewer inserted in the middle comes out clean. Allow to cool for several minutes before removing from pan. Place the cake on a serving plate and refrigerate until cool. Meanwhile, make the caramel glaze. In a small sauce pan combine the sugar and water. Place over medium-high heat. Swirl the pan (don't stir) until the sugar has melted and come to a boil. Cook the sugar until it is a rich golden, amber colour (approx. 4 - 5 minutes). Watch it carefully, you do not want it to smoke. Remove the pan from the heat and stir in the butter. When the butter is melted, pour in the cream, place back on the heat and stir until the caramel is incorporated into the cream. (Initially, when you add the cream, the caramel may seize and congeal into a ball. Just keep stirring over the heat and it will melt back into the cream.) Cook the sauce, stirring occasionally for 5 minutes. Stir in the salt and pour the sauce into a heat-proof bowl. Cool to room temperature. Pour the glaze over the cooled cake and serve. Thanks so much, Jodi! You made my evening :) Have a lovely day, and a very happy Thanksgiving! Hi what size can of pumpkin- 15 oz. or 29 oz. ? Thanks! Hi Julie! I used a 15 oz can. Thanks for asking! I'll update the recipe. Hope you love it!